WARREN, Mich. - The Chevrolet Cobalt SS Supercharged won its fourth Grand-Am Cup Series race of the season yesterday at the Mid-Ohio Sports Car Course near Lexington, Ohio. More than 1,300 United Auto Worker members and their families as well as the presidents of three UAW Locals were on-hand to cheer the win. Eric Curran and Jamie Holtom took the Street Tuner (ST) class checkered flag in the Georgian Bay Motorsports-prepared SCADAPack entry. They completed 77 laps of the 2.25-mile road course to win by two seconds when the race ended under control of the safety car. Team Cobalt entered a record seven cars this weekend - two each from the Georgian Bay, Team Cobalt California and Collision Craft teams, and a solo entry from WTF Engineering. "Mid-Ohio is the most-important race for us this season," said GM Performance Division's Ken Wasmer, whose engineering team provides technical support for all Cobalt SS Supercharged entrants in the Grand-Am Cup Series. "We were really thrilled with the turnout from the two Lordstown plants where the Cobalt is built. This year we also had hundreds of guests from the Mansfield and Parma plants. Everybody brought their families and had a great time, and we were fortunate enough to win the race and give them something to celebrate." Local presidents attending were Jim Kaster of Local 1714 at the Lordstown Stamping plant, Pamela Drake from the Mansfield Stamping plant's Local 549, and Tito Benetta from the Parma Stamping plant's Local 1005. "The GM Performance Division engineers, plus the individual team owners, drivers and crews made our 700 members and families feel like part of their family," said Kaster. "We're glad they understand how welcome that makes us feel, and how much enthusiasm it instills in us for the Cobalt racing program." "I found it very exciting, as did the 600 Local 549 members and their families from our plant," added Drake. The win increases Chevrolet's lead for the Manufacturer Championship to 13 points over Acura and 18 over BMW. Curran and Holtom now lead the Driver Championship points by 34 over BMW teammates Will Turner and Don Salama, and the Georgian Bay Motorsports team leads Grand-Am's Team Championship points in the ST class. "Cobalt has faced high-quality competition from Acura, BMW, Mazda and many other manufacturers, but Eric and Jamie have been able to show consistency this season with four wins and nothing lower than fourth place," added Wasmer. "We've forced our key competitors into quite a few "off" weekends." Holtom, the 18-year-old Canadian sensation, earned his first Grand-Am Cup pole qualifying position on Saturday with a class record speed lap. On Sunday, he drove the first 41 laps before handing off to Curran, who flew in from San Francisco after competing in another series on Saturday. Curran maintained the lead, despite intense pressure from Sylvain Tremblay's Mazda RX-8 late in the race. "The team kept me aware of the distance between us on every lap," said Curran. "I knew Sylvain was coming hard, but the ST cars ahead of me were my biggest problem, especially since I was ready to put most of them a lap down. They were not going to just move over for me." "The Cobalt SS Supercharged is an amazing car to race, and I cannot say enough for the job the GM Performance Division, the United Auto Workers, and Georgian Bay Motorsports have done." "We won this race last year, but there's a night-and-day difference between that Cobalt and this one," added Holtom. "The Performance Division's focus this year has been on the suspension package and it shows. I found if one of the faster Grand Sports cars ahead of me gave me the slightest little opening, I could dive in under him, hammer the brakes and feel confident that I'd be able to complete the pass." Team Cobalt's newest members, Ed Magner and Bo Roach were on the verge of picking up third place in their WTF Engineering Cobalt with only a few laps remaining. However, Magner was punted off course by another car, and the time necessary to remove his car from the sand trap caused the race to end under the control of the safety car. Tom Lepper and Phil Malgren finished 10th in the Collision Craft Cobalt after a 21st place start. Daniel Colembie and Jim Holtom, Jamie's father, finished 11th in the CLEARScada Cobalt, despite Colembie losing a lap at the drop of the green flag when a competitor hit his car, breaking a left front wheel. VJ Mirzayan and Paul Bonaccorsi were 14th in their Team Cobalt California car, followed in 15th by Todd Lamb and GM engineer Dave Thilenius in a Collision Craft entry. 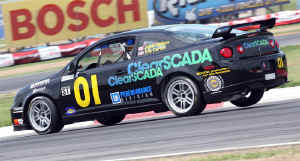 The only Cobalt that did not finish the race, for electrical reasons, was the Team Cobalt California car raced by Bryan Ortiz and Victor Gonzales. Mid-Ohio's race will be tape-delayed broadcast by the SPEED Channel on July 9 at 11 a.m. EDT. Please check local listings. The next Grand-Am Cup series race will be July 28-29 at Barber Motorsports Park near Birmingham, Ala. Engineered by GM Performance Division, the Cobalt SS Supercharged is the most powerful and agile of the model line, with a suspension developed on Germany's famed Nurburgring race track and a 2.0-liter ECOTEC Supercharged engine named among the industry's 10-Best Engines for 2006 by the editors of Ward's Communications.